Coolidge is getting ready for an exciting year ahead. She will be attending the 2018 Mrs. International Pageant Competition on July 16 in Charleston, West Virginia. Coolidge will represent Maine against 49 other lovely ladies in this country and other countries. Her first appearance in her new role will be at the Running of the Brides 5K for Hunger which will take place at Coolidge Family Farm, 1084 Lewiston Road in New Gloucester on Sunday, May 6 from 8 a.m. to 10 a.m. Tickets are available on Eventbrite under "Running of the Brides 5K for Hunger" for only $20. All proceeds from this event will go to the Good Shepherd Food Bank. Kids under 12 are free and dogs are welcome. 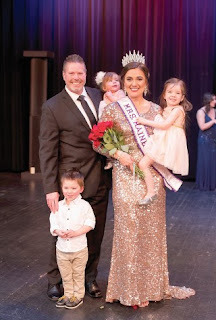 The Mrs. International Organization highlights married women, their accomplishments and commitment to family and marriage, while promoting their individual passions. The contestants’ passions are funneled into fundraising efforts to help meet the needs of others in their community or non-profit organizations. Coolidge is looking for corporate sponsorship from Maine businesses who would like to help her on her journey to raise $2500 for expenses not covered by other sponsors. For area businesses who may be interested in sponsoring Coolidge, she can be contacted at (207) 671-7479. To follow her journey as Mrs. Maine International, go to her Misty Coolidge Mrs. Maine International 2018 Facebook page.